Decatur high schooler Autumn Finney talks about her newly found recognition after her amazing play on the court. 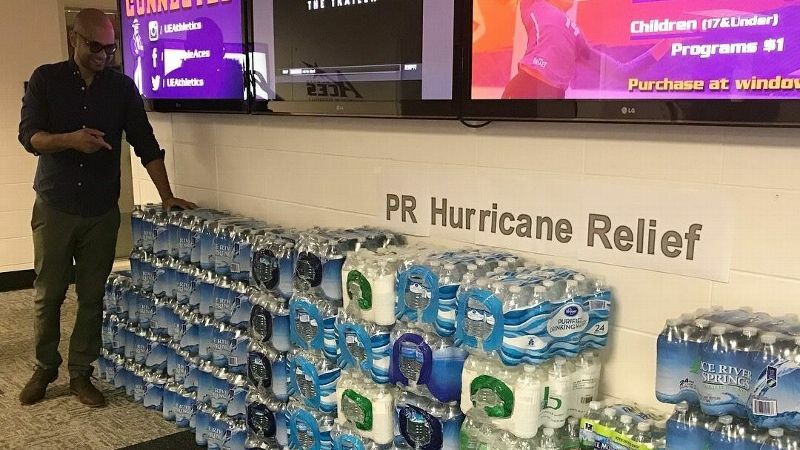 It's not every day volleyball goes viral. Then again it's not every day you see a supremely acrobatic save from a high school kid that catches the eye of a five-time Olympian. 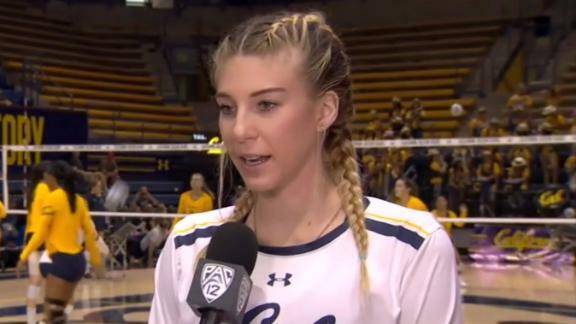 Decatur (Texas) High School's Autumn Finney's ridiculous hustle to win a point against Krum High made SportsCenter's Top 10 Plays and drew Twitter kudos from USA Volleyball and three-time Olympian Kerri Walsh Jennings, who tweeted, "I could watch this all day." "I thought a couple people in town would see it and think it was cool, but I didn't imagine it ever going viral," said Finney, the senior captain who does not plan to play volleyball in college. "When Kerri Walsh Jennings quoted the tweet, I was in shock to say the least. She has been my role model since I knew what volleyball was, and she took the time to congratulate me. It truly meant the world to me. Everything that happened after was just bonus." 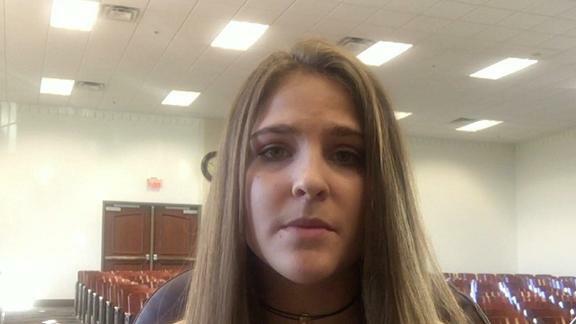 Finney, looking to join the Corps of Cadets at Texas A&M with aspirations to become a U.S. Marine, said she enjoys watching college volleyball, particularly Texas. Longhorns sophomore Micaya White, last season's Big 12 freshman of the year, is her favorite player. "She doesn't need other people to bring her up; she's confident in herself," Finney said. "She not cocky, but she doesn't need other people to pick her up." Finney grew up with volleyball but prefers track, excelling at long and triple jump. She'll play her final regular-season volleyball game tonight; who knows if we're in for another SC highlight? "A lot of people say I play like that every game. I don't think I've ever done anything that monumental," she said. "It happened so fast. When you're in it, you have the adrenaline and intensity." Finney credited teammate Tayte Helton's almost-as-spectacular dig for inspiring her to finish the play. "I couldn't let all that effort go to waste," she said. "Plus she fell and was in front of me. I knew I had to jump over her." Veronica Jones-Perry is the proud new owner of the BYU kills record with 34. It's hard to fly under the radar when you're ranked in the top 10. But BYU, checking in at No. 8 in this week's AVCA poll, has put together a 21-1 mark, the only blemish coming against Baylor in five. The Cougars have beaten Ohio State, Utah and San Diego thus far. They swept Pepperdine on Thursday and then Veronica Jones-Perry's school-record 34 kills propelled BYU over Loyola Marymount on Sunday. All those kills: "It was a battle. When my coaches told me I had 34 kills, I was really shocked by it because when you get into intense games, you're doing whatever it takes to get your team through." BYU volleyball's one-loss season: "We've got confidence in each other, and we figure out ways to win and problem-solve. When games get tough, and teams start doing things we have problems with, we adapt and keep going and figure out a way to play our type of volleyball." Her early days as a gymnast: "Growing up doing gymnastics, it was fun. But until I quit for volleyball, I didn't realize how different it was being part of a team versus having friends on a team." Her future: "I want to be a strength and conditioning coach." Can't get her out of the gym: "I really enjoy lifting. I'm really a slow lifter. When the team lifts, I'm in there 30 or 40 minutes after because I take my time and enjoy doing it." In the weight room: "I like '80s rock. My family grew up camping and boating and we'd listen to Poison and Motley Crüe." Love and volleyball (Jones-Perry married her high school sweetheart, Todd): "He takes a lot of pressure off me. If I have a long day, I know I can come home and he's going to take care of dinner because he's had a shorter day. We teamwork through life." If only ... : "I wish I had a dog. My mom just got this Mastiff puppy, and I'm clearly in love with him." Conference play reached the halfway point last weekend. Here's how it breaks down so far. • No. 2 Stanford reigns supreme atop the Pac-12. The Cardinal aren't a shoo-in to win the conference, but in stringing together 12 straight, Stanford has only been extended to five twice, at Colorado a month ago and at Washington last Thursday. Kathryn Plummer rallied the Cardinal against the Huskies, recording 20 kills, 10 digs, five blocks and two aces. • The match between No. 4 Florida and No. 6 Kentucky in Lexington on Nov. 1, a UK "socks giveaway" night, is key. The Wildcats upset the Gators in Gainesville on Oct. 15. If they win again, they'll be in prime position to become SEC champs for the first time since the 1988-89 season. • Pitt had a chance to wrest control of the ACC, but lost to NC State on Sunday, which fell to North Carolina on Wednesday. The Panthers and Wolfpack are tied at 9-1 for first place in the ACC followed by Louisville at 8-2. • Top-ranked Penn State and No. 7 Nebraska lead the Big Ten race, with the Cornhuskers holding the advantage after beating the Nittany Lions 3-0 on the road. Penn State also has the tougher half of its schedule remaining with two dates against Wisconsin and one against Minnesota coming up. Michigan State and Minnesota are a game behind the leaders. • No. 3 Texas is unscathed in the Big 12, including a win over Kansas in five. The teams meet again on Nov. 15 in Gregory Gymnasium. Baylor is right behind at 6-2 in Big 12 play. • Penn State and Minnesota are 1-2 in RPI released on Sunday. Florida and Kentucky follow with Nebraska at 5. The 16th-ranked Bluejays are back in control of the Big East after sweeping Seton Hall on Sunday. Creighton and Marquette were tied atop the league going into the weekend, but the Golden Eagles fell in five to Butler despite a career night from sophomore Allie Barber (27 kills). Marquette handed Creighton its first Big East loss since 2015 when the teams played on Oct. 5. They meet again in Omaha on Nov. 4. Before that, the Bluejays play a pair at Providence, facing the Friars twice because of a scheduling quirk. The two teams agreed last year to play consecutively on the same weekend at the same site to avoid extra travel. Last year the Bluejays swept both games in Omaha. No. 9 Wisconsin at No. 1 Penn State: Wednesday is the first of two meetings for the teams this year. The Badgers will try to bounce back from a 3-1 loss to Minnesota against a Nittany Lions team that has won nine in a row. No. 12 Utah at No. 15 Oregon: The Utes look to rebound from their loss to USC in this Wednesday matchup. Oregon prevailed over Utah a month ago in a match extended to a 21-19 fifth. Hawaii at No. 23 Cal Poly: The Mustangs hadn't beaten Hawaii since 2006 until earlier this month, a five-setter. Can they make history on Friday by snagging the series for the first time ever from the Rainbow Wahine? No. 18 San Diego at No. 8 BYU: The Cougars took the first meeting. 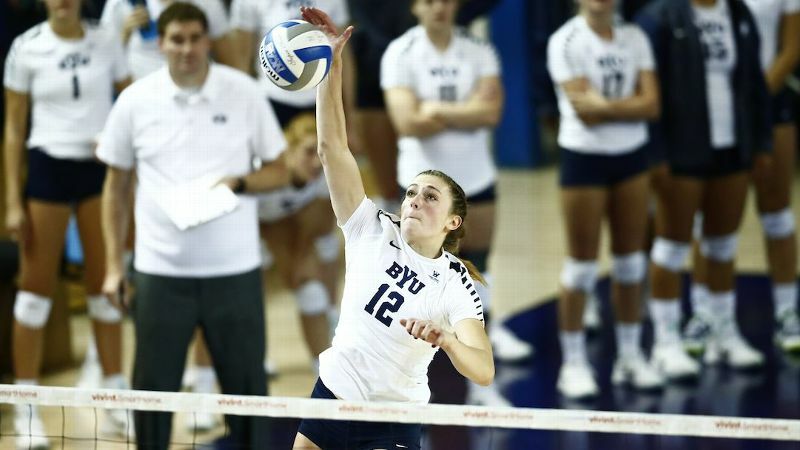 A win on Friday sets BYU up to sweep the West Coast Conference.